TEKPLUS VR Headset, Your IMAX Private Theater, Can Provide You the Best Immersive Virtual Reality Experience. --3D Private IMAX, panoramic roaming, immersive videos games experience. --Imported PMMA aspherical optical lens ensure high-definition visual and better clarity. --Anti-blue light and anti-radiation lens protect your eyes well. --Adjustable pupil distance(PD) and focus distance(FD), suitable for people under 600 degrees myopia. --FOV 102 degrees for immersive 3D large view. --Light weight design and less pressure on eyes, face and head. --Flexible headband suitable for people from children to adults and comfortable face cushion padding. --Removable magnet front cover and both side holes for ideal heat dissipating. --Compatible with most IOS / Android smart phones from 4.0-6.0 inches. --Smart phones installation and protection. Strictly product inspections before shipping. --Easy operation & convenient phone answer/pause/play/volume +/volume- button without take off the headset. Phones supported: 4.0 - 6.0 inches IOS/Android Smart Phones. 1.Do not play when charging your smart phones. 2.The remote is not a game remote. It can only control the videos pause or play, volume up or down, forward or backward. 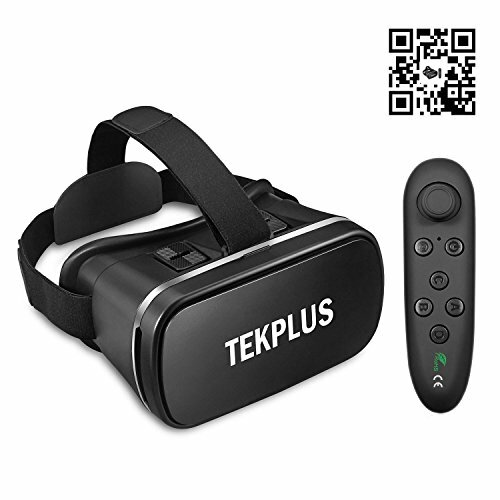 Professional Optical Material & Anti-blue Light Lens --TEKPLUS VR headset applies imported optical PMMA material to ensure high-definition visual. With aspherical anti-radiation and anti-blue light lens design, you will not feel visual fatigue and dizzy even after hours usage, which perfectly protect your eyes when you are enjoying 3D movies and games. Adjustable Pupil and Focus Distance -- You can easily adjust the pupil distance(PD) and focus distance(FD) through moving the two sliders on the TEKPLUS VR Goggles so as to enjoy a panoramic IMAX private theater experience with a immersive 3D view of FOV 102 degrees, even to users with myopia problem(under 600 degrees). Comfortable, Breathable Wear Design -- Adjustable head belt, eco-friendly durable foam leather, and light weight can decrease pressure from eyes, face and head, offering more comfortable wearing and fitting any people from children to adults. Magnet adsorption type front cover and both sides holes for phone cooling, greatly enhance the heat dissipation effect for long-time use and prevent the VR glasses from being fogging. Please Note: The VR Bluetooth controller is a free gift for our customers. It is not a game remote and can only control the video's pause or play, volume up or down, forward or backward etc. If you need to play games, we suggest you to choose a professional game remote. Besides, Apple IOS system is a closed system, so the controller perhaps can't be connected well with iPhone. After-sale Service: Tekplus Team pay most attention to our customer service and product quality. If you have any questions with our headset at any time, please no hesitate to contact us. We will strive to solve the problems to your satisfaction. It will be a great gift idea for your families, friends or lovely kids! If you have any questions about this product by Tekplus, contact us by completing and submitting the form below. If you are looking for a specif part number, please include it with your message.